Even though it has been years since my husband has smoked, my brother was able to give these a whirl. 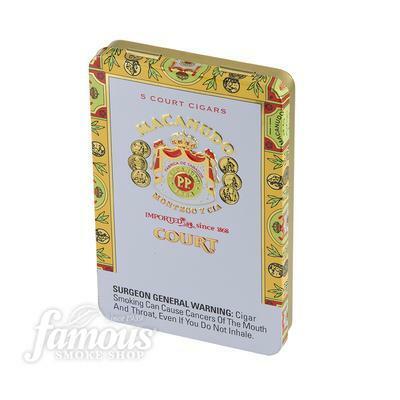 They aren't his usual brand and had never even tried them before but liked that they were individually wrapped and smaller for when he doesn't have time to smoke a whole cigar. He was very pleased and wanted to know how to buy more. You can purchase these online here. What Famous Smoke has to say about their product. Macanudo cigars are America's most-requested premium cigar. Always mild, aromatic and easy to draw, these fine cigars are handcrafted in the Dominican Republic with silky Connecticut shade wrappers that are triple-fermented for extra smoothness. From the little Ascots to the towering Prince of Wales, Macanudo is recommended for both sexes and to those new to premium cigars. Every cigar smoker should experience Macanudo's creamy flavor and sweet aroma at least once in their lifetime. Disclosure: MarksvilleandMe received one or more of the products mentioned above as part of a promotion with Tomoson and Famous Smoke. Regardless, MarksvilleandMe only recommends products or services we use personally and believe will be good for our readers. Some of the links in the article may be “affiliate links.” This means if you click on the link and purchase the item, I will receive compensation. If you would like MarksvilleandMe to review a product or service please contact us at marksvilleandme@gmail.com.